3621 Spring Forest Road, Raleigh, NC, U.S.A. This hotel is situated among business offices, shopping and restaurants, northeast of the Raleigh city centre. This hotel caters to business travellers and offers free Wi-Fi, a lap desk, a business centre and dry cleaning service. Both smoking and non-smoking rooms are available. All rooms include free Wi-Fi, a 32" flat screen TV with pay-per-view movies, a mini-fridge, a microwave, a coffeemaker, an iron and ironing board, a lap desk, a hair dryer and individual climate control. This hotel offers suites, which provide more spacious accommodations and a sofabed. Accessible rooms are also available. A free breakfast is served daily from 6 am to 10 am. This hotel does not have an on-site restaurant. Other on-site amenities include an indoor pool, a fitness centre, a business centre, coin-operated laundry machines, dry cleaning, luggage storage and safe deposit boxes. Triangle Town Place, a shopping centre, is a 5-minute drive away, while the Time Warner Music Pavilion is 12 minutes away by car. The city centre area is 15 to 20 minutes away by car and features the North Carolina State Capitol, the Marbles Kids Museum and the Progress Energy Center for the Performing Arts. Pullen Park, which is an amusement park, is about a 20-minute drive away, while the Carolina Theater is a 35-minute drive away. Verified by a front desk agent on September 18, 2013: Free breakfast hours. Among the reviews used for this analysis, guests seemed impressed with the cleanliness and customer service. The staff were frequently complimented for their friendly and accommodating service, while many guests described their rooms as clean and comfortable. A few reviewers found the beds comfortable. Several guests found shopping and restaurants nearby, while a couple of reviewers thought that this hotel provided convenient access to highways. Several reviewers enjoyed the pool and fitness centre, while several guests appreciated the free breakfast. There were very few common concerns found for this hotel, among the reviews sourced for this editorial. However, a couple of guests thought that their rooms were in need of some upgrades and a couple of reviewers specifically mentioned that the in-room air-conditioning units should be updated. While several guests appreciated the free breakfast, a few reviewers were not happy with the food served. Expedia.ca gave this hotel an average score of 4.4 out of 5, with 97% of 60 guests recommending the property. 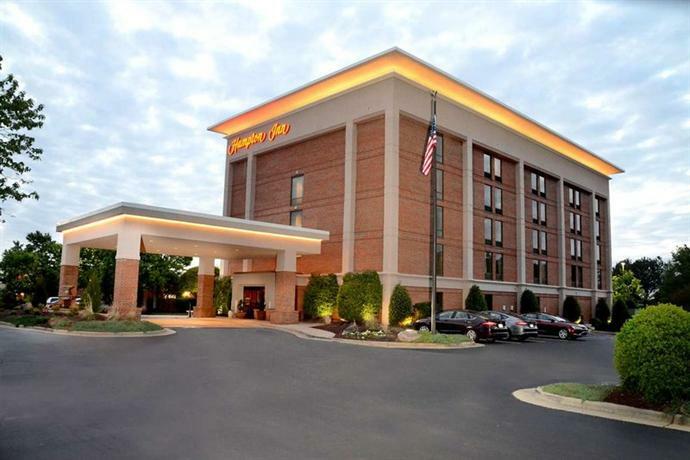 TripAdvisor.ca ranked this hotel #20 out of 80 hotels in Raleigh, with an average score of 4 out of 5, from 92 reviews. The author called the hotel on September 19, 2013 to verify some information. Rating: #27 out of 89 hotels in Raleigh ranked by guests. "The bedroom was not as clean as we are use to seeing for Hampton Inn; There was a plastic bottle lying under the dresser, the Alarm clock did not work, there was a sticky substance on the night stand and the AC did not cool adequately. Breakfast was not fresh, but only pre-packaged." "Although the hotel is only a 15 minute ride to the airport, a taxi cost $50. Since it is the first time I have taken that ride I don't know if it was an inflated charge, but it seemed high for Raleigh. The airport is quite nice, was uncrowded and there was only about a five minute wait at security."